MUSIC NEWS- It must be summer, as just a few days after news of a summer YES/Toto tour, two more classic rock acts of the ‘70s announced more dates on their previously announced co-headline run. Peter Frampton and Cheap Trick added sixteen more dates to their co-headlining tour of North America starting in June. The current list of shows below. Oh and be careful when taking pictures during Frampton’s set. In summer 2014 Mr F made headlines when he grabbed the cellphone of a fan, who had been previously told to put it away, and threw the patrons device across the hall. “When I go to do a show, it’s my time,” Frampton said later. “It’s all about me. You’ve come to see me. You haven’t come to see me if you’re in an armchair watching a video. It’s very distracting.” Oh my, touchy, touchy! Music News - After the band's sold out show at Madison Square Garden, alt-J announce additional dates to their 2015 North American Summer Tour and new concert dates for this fall. The band will play select festivals this summer such as Lollapalooza and Osheaga before kicking off their fall tour with select Canadian dates then heading to the Midwest USA on September, 17 to play the Roy Wilkins Auditorium in St. Paul, MN. alt-J will play throughout the Midwest and south before heading west and ending their tour at Key Arena in Seattle, WA on October 18. With the release of their sophomore full length, This Is All Yours, and their first Grammy Nomination for Alternative Music Album of the year, 2014 was a banner year for alt-J. The band was named Spotify's "Breakout Artist" in their Year in Music review. Rolling Stone ranked This Is All Yours #27 on their Albums Of The Year, TIME ranked it #3, and the album placed on NPR's Favorite Albums of 2014. Music News - YES and Toto today (4/6) announced they will join up summer for a co-headlining North American tour. Having once been one of the world’s most influential, ground-breaking, and respected progressive rock bands, Grammy Award-winning YES has sold nearly 40 million albums in a career that has so far spanned more than four decades. YES continues, without Jon Anderson, with its tradition of symphonic progressive rock. Since its founding in 1968, by Jon Anderson and Chris Squire YES has created much of rock history’s most important music, including iconic pieces like “Roundabout,” “Close to the Edge,” ”I’ve Seen All Good People,” “Starship Trooper,” and countless others. Its albums, including Fragile, Close to the Edge, Tales from Topographic Ocean, have been certified multi-platinum, double-platinum, platinum, and more by the RIAA. “We’re thrilled to be hitting the road with Toto. Yes have always been big fans of Toto’s music, and we think the fans are going to really enjoy seeing both of us together,” says YES co-founder and bassist, Chris Squire. The current line up has not been confirmed at time of tour announce, stay tuned. YES will be releasing a new live CD/DVD (recorded at the Mesa Arts Center in Mesa, Arizona) titled Like It Is on July 7. MUSIC NEWS- Five-time GRAMMY Award winner James Taylor will release Before This World, the legendary singer/songwriter’s first album of new songs since 2002’s platinum-selling October Road. 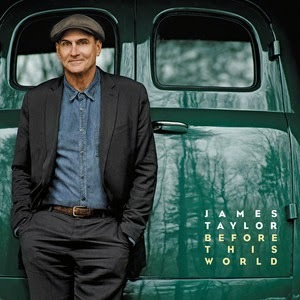 Produced by Grammy Award-winner Dave O’Donnell, Before This World features ten songs, nine of which are brand new James Taylor compositions, and is due out June 16, 2015 via Concord Records. In addition, the special 2-Disc CD/DVD Before This World Deluxe Edition includes the full-length album on CD plus "There We Were: The Recording of James Taylor’s Before This World,” a behind-the-scenes documentary about the making of the album on DVD. Through studio footage and interviews (including Taylor and album guests Sting and Yo-Yo Ma) this beautifully rendered 30-minute film provides an intimate look into Taylor’s creative process and the recording of this landmark album. MUSIC NEWS -Mac McCaughan's limited-edition hand-numbered "Box Batteries" b/w "Whatever Light"7-inch will be available in independent record stores and at Mac's shows beginning April 7. Mac premiered a stream of the A-side on line today. An alternate version of "Box Batteries" appears on Mac's full-length album Non-Believers out May 5 via Merge Records. Listen and share the track now and pre-order Non-Believers on CD or LP in the Merge store. Mac has announced solo touring dates which will feature Flesh Wounds opening shows and also serving as his backing band. A full list of dates below, don't miss 'em! MUSIC NEWS- Robert Plant and the Sensational Space Shifters have announced their 2015 concert tour. The run kicks off on Sunday, May 24, at the Sasquatch! Festival in George, WA. The tour includes his return to Bonnaroo the weekend of June 12, and finishes off on June 17 in Philadelphia, PA, at the Mann Center. The complete itinerary is below from MNN. Each ticket to the non-festival shows will include a CD of the band's latest album, lullaby and...The Ceaseless Roar. The Pixies will be opening five of these shows; JD McPherson four of them, as noted below in the itinerary.